You want the carpeting in your business or industrial complex to endure high volumes of foot traffic and visibility. 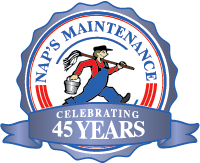 To help ensure your carpeting gets the attention it needs, Nap’s Maintenance provides carpet cleaning for business and industrial locations. The last thing you want is for a potential customer to walk into your company and notice spotted or stained carpet. Our method of choice is forced hot water extraction. It leaves no residue behind in your carpet. This residue reactivates when your carpet dries, so the stains only fade, but never go away completely. Other carpet cleaning methods leave 80% of the soap in the carpet after cleaning, but the hot water extraction method only leaves about 10%. The result is carpet that smells fresh, and looks and feels clean. Your carpet will wear better as time goes on if you have it cleaned regularly. Carpet usually dries in 6-8 hours; we provide fans to speed up drying if necessary.